On my right hand I wear a ring–just a small ruby solitaire, set in a narrow gold band with a bit of delicate embellishment on either side. I’ve owned the ring since I was a young teen—a long time ago! Yet the ring is even older than I am, passing its one hundredth birthday back in 2004. The original owner was my grandmother. 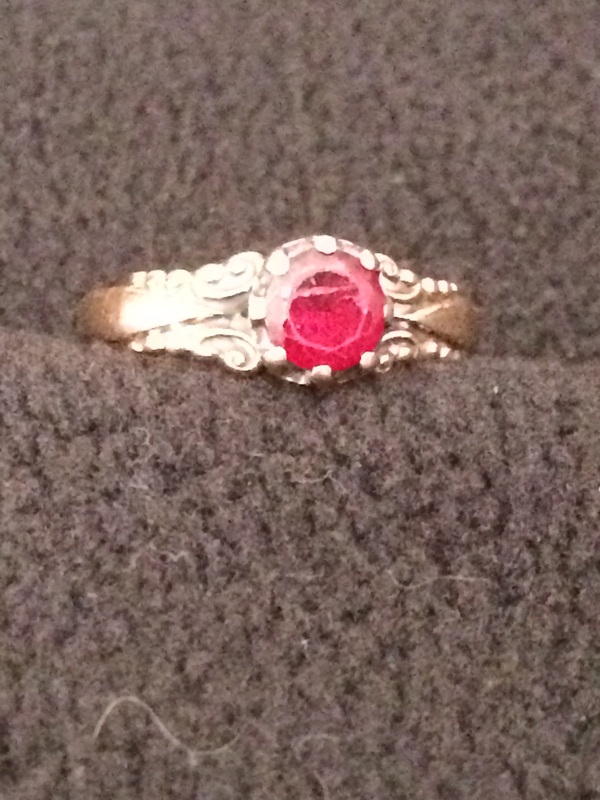 Great Grandpa and Grandma gave her the ring in 1904, on her fourteenth birthday. On my fourteenth birthday, she surprised me by passing the ring on to me. Perhaps you, too, own a cherished possession that may not appear significant to others, but is highly valuable to you. In fact, you treasure it. On a much grander scale, God treasures you. You are dearly beloved and precious to him. Oh, no, some will say. Not me. I’m not good enough, smart enough, or talented enough to be highly valued. (“For you know that God paid a ransom to save you from the empty life you inherited from your ancestors. And it was not paid with mere gold or silver, which lose their value. 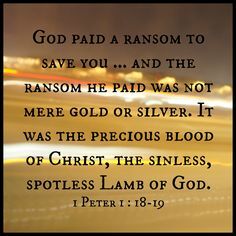 It was the precious blood of Christ,the sinless, spotless Lamb of God” (1 Peter 1:18-19). God paid a very high price with the precious blood of his own Son, in order to make you his treasured possession. Evidently goodness, smarts, and talent have nothing to with it (Ephesians 2:8-9)! And God doesn’t view you as ordinary, anymore than I consider my ruby ring ordinary. You are precious and honored in God’s sight simply because he loves you (Isaiah 43:4). Just as God went to great lengths to bring his precious children of Israel out of captivity, so he has gone to great lengths to bring you into his family. He is constantly thinking about you (Psalm 139:17)–preparing for your welfare, providing for your needs, guiding and guarding until it is time for your final journey to heaven. He blesses you with all spiritual blessings (Ephesians 1:3). It is not the material stuff of the outer life that satisfies; it is the wealth of spiritual blessings of the inner life. God offers: forgiveness of sin, freedom from guilt, peace of mind, joy of heart, wisdom, comfort and strength—to name a few. 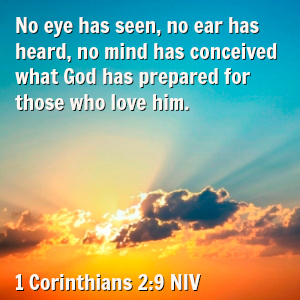 God has prepared for you an eternity of absolute bliss (1 Corinthians 2:9). Think of it. God Almighty sees and appreciates your value, your beauty. He speaks affirmation and restoration to your soul through his Word (Psalm 19:7). He listens with wrapt attention when you call to him (Psalm 145:18). 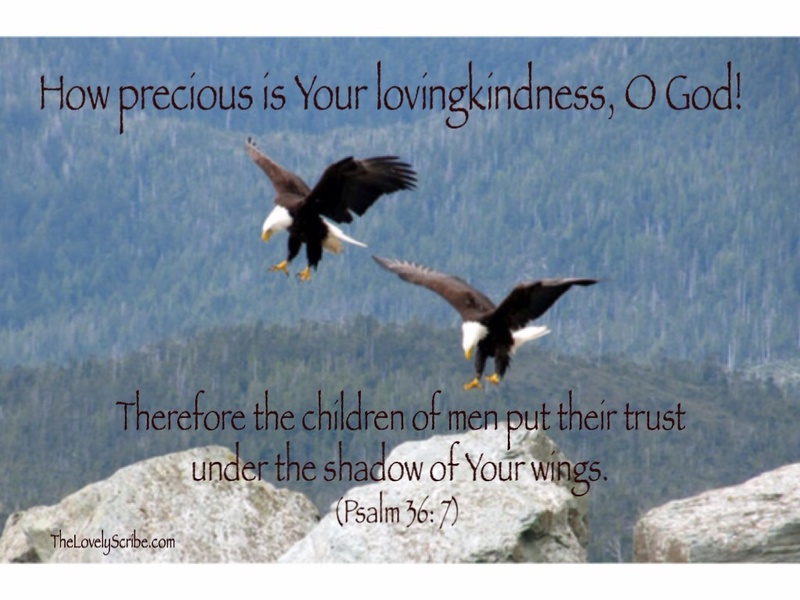 He enfolds you in his wings of protection and comfort (Psalm 36:7). He is with you, for you, and in you. 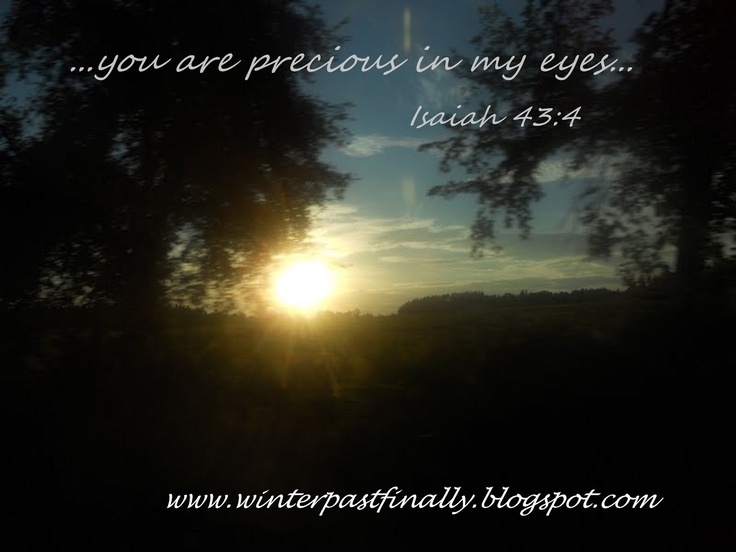 (Photo and art credits: Nancy Ruegg; http://www.pinterest.com; http://www.winterpastfinally.blogspot.com; http://www.faithgateway.com; http://www.thelovelyscribe.com.